Thunderball (1965) is the fourth spy film in the James Bond series after Dr. No (1962), From Russia with Love (1963) and Goldfinger (1964), and the fourth to star Sean Connery as the fictional MI6 agent James Bond. It is an adaptation of the novel of the same name by Ian Fleming, which in turn was based on an original screenplay by Jack Whittingham. It was directed by Terence Young with screenplay by Richard Maibaum and John Hopkins. The film follows Bond’s mission to find two NATO atomic bombs stolen by SPECTRE, which holds the world ransom for £100 million in diamonds, in exchange for not destroying an unspecified major city in either England or the United States (later revealed to be Miami). The search leads Bond to the Bahamas, where he encounters Emilio Largo, the card-playing, eye-patch wearing SPECTRE Number Two. 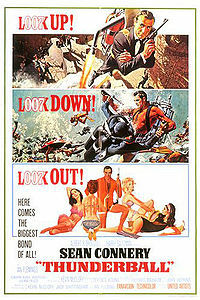 Backed by the CIA and Largo’s mistress, Bond’s search culminates in an underwater battle with Largo’s henchmen. The film had a complex production, with four different units and about a quarter of the film consisting of underwater scenes. Always searching for the perfect actors to play James Bond and future Bond Girls. Huge fans of the franchise, and how Ian Fleming’s character has evolved over the years. What woman should play James Bond? When did James Bond jump the shark? Who is the best James Bond? Who should the next James Bond be?